FP Logistics offers state of the art audio equipment from fine brands such as Allen & Heath, Audio-Technica, Audix, dbx, JBL, QSC, Sennheiser, Shure, Soundcraft, Tascam and many more! Microphones: Given the range of instruments and performers these days, the right microphone can make all the difference in the world. Find the right wired or wireless microphone at FP Logistics! 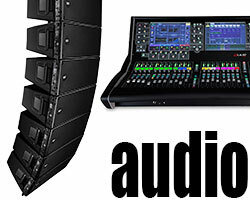 Audio Mixers: How many channels? Analog or digital? Built in effects? There may be a lot of questions when looking into an audio mixer, but one thing you can be sure of - FP Logistics has the mixer to suit your needs! Amplifiers: For your passive speakers to work, you'll need a power amplifier. FP Logistics carries the latest technology in power amplifier with or without signal processing! Speakers: FP Logistics carries a wide selection of professional quality loudspeakers in multiple configurations! Whether you're looking for powered or passive, line array or ground stack, we've got the boxes you're looking for! Monitors: FP Logistics carries a wide selection of professional quality floor wedges, wired and wireless in-ear monitors to suit all your performance needs! Processing: Audio processing allows users to fine tune and adjust audio through a variety of different functions and effects. At FP Logistics, you'll find a wide variety of audio processors at discounted rental prices every day! Accessories: Whether you're looking for a specialty direct box or a standard mic cable, FP Logistics has the right audio accessories to get you up and running!